Okay… HATE might be a strong word, we’ll use dislike. This episode of First We Feast Hot Ones with Ty Burrell really got me thinking a bit more on why people probably say they hate or dislike vinegar based hot sauces. Being from Hawaii and the melting pot that it is, I grew up eating a lot of different types of vinegar. Vinegar is quite amazing in my opinion, but I’ll admit, I may come off a bit biased about this topic. I really believe there is a misunderstanding about vinegar and if something is labeled with vinegar, it’s assumed it taste the same as all the cheap white distilled vinegar that’s most common. All of these have unique flavor profiles, strengths (Acidity) and uses. In our hot sauces we use a very high quality Japanese made Apple Cider Vinegar and Rice Wine Vinegar. Most people are surprised at how good our hot sauces taste, especially after they just said “I hate vinegar based hot sauces”. It all comes down to ingredients. What you put in, is what you’re going to get out. You put a low quality horrible tasting vinegar into a sauce, you’re going to get a horrible tasting sauce. But if you use the right high quality vinegar and use it in the right proportions, you’ll get a very balanced and flavorful hot sauce in the end. What ingredients are used in the process of making cheap white distilled vinegar? One that’s used a lot is corn. And in the U.S. that most likely means GMO corn. Another factor is that manufacturers of these cheap vinegar’s are allowed to use natural gas and petroleum* in the process… yuck! Now I know why it taste so bad!!! Another really interesting point about high quality natural vinegar’s, is how good they are for your health. Especially at Farmers Markets while sampling, we usually get an older man or women that will say they can’t eat food with vinegar due to the acid in it. For instance, vinegar has been used forever as a way to counteract acid reflux, by neutralizing the stomach acid. There are many, many health benefits that vinegar provides. 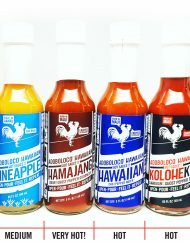 If you’re a vinegar hot sauce hater, I dare you to give one of our hot sauces a try. I promise, it won’t hurt… well maybe a little if you go for one of our really hot ones like Hamajang or Maui No Ka Oi. What are your thoughts on vinegar? Leave a comment below.